As the Gaming Authority continues to review the application made by SleepIn International Hotel and Casino Inc. for a casino licence, the financial statements which the management of the establishment had volunteered are yet to be delivered. “They asked for an opportunity to put in further financial documents. So far they have asked for two extensions to do that and they have not brought anything”, the Gaming Authority’s Chairman Roysdale Forde said last week. Clifton Bacchus, the manager/proprietor of the hotel had to submit a new application earlier this year after the Authority rejected the application over a failure to provide documents on the establishment’s “financial soundness and capability”. A site visit to the establishment which was built at a cost of US$20M was conducted in August of this year. Contacted for an update on the application, Forde assured that the matter is still pending. He explained that a request was made to the authority for further documents to be submitted and that opportunity was granted. He said that the Authority had granted Bacchus’ request and are now awaiting the submission of the documents. The Authority rejected the first application. The Authority said that having received and thoroughly considered the application, it unanimously found no evidence upon which it could arrive at a determination that SleepIn International Hotel & Casino Inc. qualifies for the issuance of the licences applied for, having regard to its failure to provide the Authority with documents evidencing its financial soundness and capability, which is one of the critical criteria for the granting of such licences. 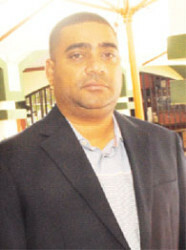 Bacchus who has another hotel on Church Street and another on Brickdam, had previously explained that in 2014, he signed a Memorandum of Understanding (MoU) with the then Donald Ramotar administration for a licence to operate a casino once he was able to complete construction in line with several specifications. He explained that as part of the MoU with the previous government, the Guyana Revenue Authority (GRA) authorised the release of the gaming machines ahead of him being granted the casino licence. The slot machines were installed and the businessman has repeatedly stressed that they are not in use. In August the Authority asked the company and its directors to submit income tax returns for a seven-year period. Bacchus received a letter late last month asking that he, the hotel as well as directors Zena Paul and Jennifer Paul-Bacchus submit their returns for the past seven years. Sections 29 A and 32 (1) of the Gambling Prevention Act gives the Gaming Authority the power to request such information. These amendments are contained in the Anti-Money Laundering and Countering the Financing of Terrorism (Amendment) Act, which was assented to by President David Granger on July 10, 2015. It was on the basis of these amendments that the Authority requested the income tax information. Persons close to the hotel are convinced that this request was all part of the Authority’s plan to deny Bacchus a casino licence. If granted, the establishment would be the country’s second casino. Sources close to Bacchus have said that he is very frustrated as his first application was denied and he fears that his current application might face a similar fate.